Abbott Labs‘ (NYSE:ABT) revenues have increased by $7.7 billion (net) between 2013-2017. Gross profits also increased by $5.5 billion during the same period. Most of this change was led by the company’s Medical Devices segment, which benefited from the St. Jude acquisition. 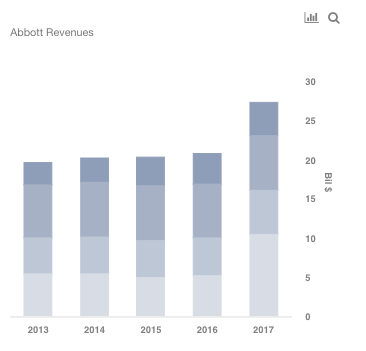 We have created an interactive dashboard analysis on how Abbott revenues and profits have changed over the last few years, and our estimates for 2018. 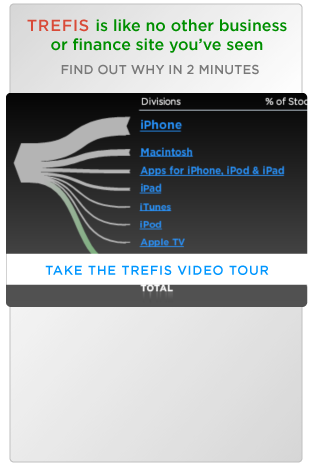 You can adjust the expected segment-wise revenue, and margin forecast for 2018, and see its impact on the overall revenues and earnings. Between 2010 and 2016, Abbott’s revenue hovered around $20 billion, growing at a CAGR of just 1%. This prompted the company to expand inorganically, with the acquisitions of Alere and St. Jude Medical, which led to a sharp jump in revenue in 2017. Abbott’s gross profits also grew strongly from $10.8 billion in 2013 to $16.2 billion in 2018. Most of this growth can be attributed to the Medical Devices segment, which saw profits doubling (y-o-y) after the St. Jude acquisition in 2017. With these acquisitions, the company gained access to the fast growing rapid and point-of-care diagnostics market, as well as significantly improving its presence in the cardiovascular market. The Medical Devices business is Abbott’s largest segment, and accounts for nearly 40% of its revenue and gross profit. We forecast the segment revenues to grow in mid-single digits in 2018, and beyond, benefiting from the company’s robust pipeline of coronary stents, and an overall increase in demand in the emerging markets. The company’s Diagnostics segment also benefited from the Alere acquisition, and we forecast the segment revenues to grow 40% in 2018. Beyond 2018, we expect the revenues to grow in mid-single digits, benefiting from its licensing agreements, which will likely boost its market share, and an uptick in overall healthcare demand, primarily from the emerging markets. It should be noted that the year 2018 will reflect the full impact of these two acquisitions.